These are lyrics by Ciara that we think are kind of nonsensical. Best believe I'm number one! What if Ciara?s not number one in the charts at the time you're listening to this song! Ciara, at hte moment, you're not in the charts at all, and the Crazy Frog's number one. (that bloody frog! where'S the razor blade! why is is number one??? it shouldn'T have charted at all, and if it did, it should have got to number 40!!!!!!!!) 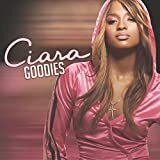 Anyway Ciara, Goodies was No. 1, maybe you wrote these lyrics when that was No. 1! Sorry Ciara, I don't believe you're No. 1!